Do you like play beach volley ??? Where do you play ??? 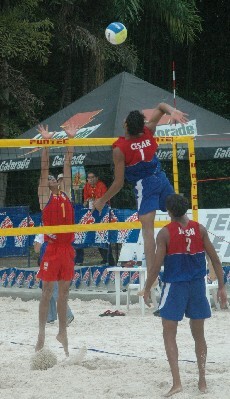 I love play beach volleyball!!! I play here in Brazil, in Rio de Janeiro!!! XD I play it everyday! AND YOU??? However, go play beach volley!!! I like to play beach volleyball. I started playing it in the last summer and joyed it. I can play it little place named Puhja, which lies in South-Estonia. Unfortunately I can't play it right now, because here is winter and outside is really cold. Can i join?,.hEheH.. i do love volleyball, but i don't play beach volleyball because the main reason is there are no beach here near our place. but every end of the week we play here in our court 6 on 6 here in Philippines,in Cavite..